The weather may or may not be warming up near you, but in our studio it’s officially spring now that the new Oliver + S spring patterns have arrived! The patterns are on their way to shops around the world, and are now available for purchase on our website. To give you a taste of what’s possible with these new designs, we had a few samples made in some darling Moda fabric. (See the end of this post for details on the fabric selections.) 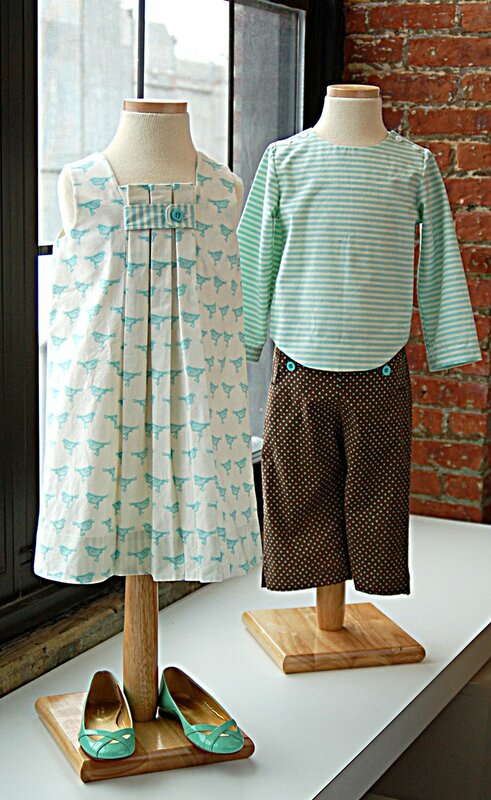 Here’s a shot of the new dress and the new sailor outfit–featuring the pants option. We think you’ll be able to get as excited as we are about these two patterns and all the creative options they offer. The Birthday Party Dress, which features three box pleats at the center front, can be either dressed up or dressed down depending on the fabric you select. A silk dupioni would turn this dress into something appropriate for a special occasion (we’re making one in dupioni for Easter, which we’ll show you soon), while a printed cotton is just right for everyday play. 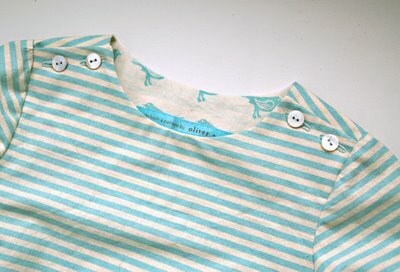 The little asymmetrical button tab in the front can also be sewn as a big bow, which give lots of design opportunity for a contrast fabric or a favorite ribbon. We included our signature hem facing detail as well, which offers the option to include a splash of color or a contrast print at the inside of the hem. The Sailboat Top, Skirt, and Pants pattern gives you a top and the choice of completing one of two bottom options: an A-line skirt, or sailor-style pants. Despite all the interesting detail included, this pattern is one of our easiest—just one of four scissors in difficulty rating. Novice sewers will surprise themselves by the detail they are able to achieve with this pattern—thanks to our clear construction techniques and detailed instructions. We think you’ll really enjoy these two new styles, and we’re looking forward to seeing your creativity with them show up in our Flickr group. Over the next couple days, we’ll be doing more detailed posts that highlight some ideas for what you can do with these new styles. Can you hear me squealing? You’ve created a loyal customer in me, I love your designs, please never stop making them! Your fabric choices for these outfits are incredibly cute. Forget the fabric I’ve been hoarding while waiting for your new patterns, I’m going fabric shopping tomorrow! And I adore the little teal flats! Way too cute! I can hear Karen squealing!!!! LOL! Those look adorable all together – just darling! And, the aqua flats – PERFECT! I keep drooling over your patterns and trying to get up the nerve to buy one for my daughter’s clothes! 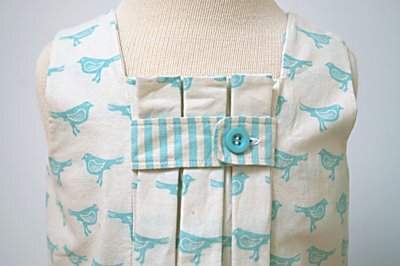 I’ve never sewn clothes before (buttons – yikes!) but your patterns get me so excited! Thank you for doing what you love and designing such sweet clothes! Your patterns are absolutely adorable! Oh my gosh those fabrics are adorable! I love your creations! I can’t wait to make them myself. I love that you have given us a so many great choices with these new patterns. I can imagine my children in these little clothes. And WHERE did you find those FABULOUS FLATS? Do those little teal flat come in big girl sizes? Seriously. I need them. 🙂 I think the birthday dress is my favorite so far. Oh, they’re gorgeous! I’m not sure if I’m ready for 3 scissors yet, but I’m working up to it! So excited!